When President Reagan was campaigning for office in 1980, he said, "Should our shipbuilding ca- pacity continue to decline, Ameri- can mobilization potential will be seriously undermined because a large reduction in a skilled ship- building workforce today makes any increase tomorrow very diffi- cult. This is a dangerous threat to our national security, jobs, and a key U.S. industry." Jones Act trades be opened to for- eign-flag ships. The first suggestion, to allow subsidized U.S. operators to ac- quire foreign-built vessels, has been implemented and the damaging result to the major shipyards is all too clear—that segment of the shipbuilding industry has been ex- ported overseas. 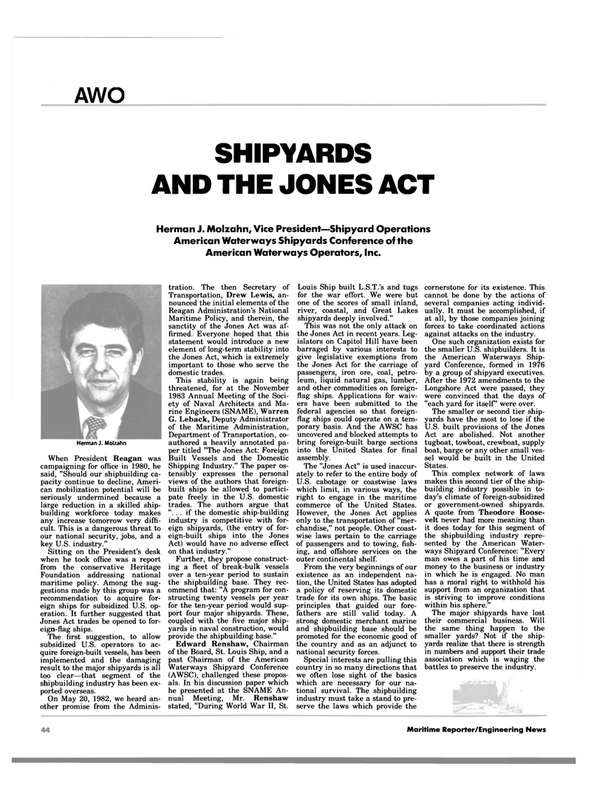 Maritime Policy, and therein, the sanctity of the Jones Act was af- firmed. Everyone hoped that this statement would introduce a new element of long-term stability into the Jones Act, which is extremely important to those who serve the domestic trades. Act) would have no adverse effect on that industry." Further, they propose construct- ing a fleet of break-bulk vessels over a ten-year period to sustain the shipbuilding base. They rec- ommend that: "A program for con- structing twenty vessels per year for the ten-year period would sup- port four major shipyards. These, coupled with the five major ship- yards in naval construction, would provide the shipbuilding base." Waterways Shipyard Conference (AWSC), challenged these propos- als. In his discussion paper which he presented at the SNAME An- nual Meeting, Mr. Renshaw stated, "During World War II, St.
Louis Ship built L.S.T. 's and tugs for the war effort. We were but one of the scores of small inland, river, coastal, and Great Lakes shipyards deeply involved." This was not the only attack on the Jones Act in recent years. Leg- islators on Capitol Hill have been barraged by various interests to give legislative exemptions from the Jones Act for the carriage of passengers, iron ore, coal, petro- leum, liquid natural gas, lumber, and other commodities on foreign- flag ships. Applications for waiv- ers have been submitted to the federal agencies so that foreign- flag ships could operate on a tem- porary basis. And the AWSC has uncovered and blocked attempts to bring foreign-built barge sections into the United States for final assembly. U.S. cabotage or coastwise laws which limit, in various ways, the right to engage in the maritime commerce of the United States. However, the Jones Act applies only to the transportation of "mer- chandise," not people. Other coast- wise laws pertain to the carriage of passengers and to towing, fish- ing, and offshore services on the outer continental shelf. From the very beginnings of our existence as an independent na- tion, the United States has adopted a policy of reserving its domestic trade for its own ships. The basic principles that guided our fore- fathers are still valid today. A strong domestic merchant marine and shipbuilding base should be promoted for the economic good of the country and as an adjunct to national security forces. Special interests are pulling this country in so many directions that we often lose sight of the basics which are necessary for our na- tional survival. The shipbuilding industry must take a stand to pre- serve the laws which provide the cornerstone for its existence. This cannot be done by the actions of several companies acting individ- ually. It must be accomplished, if at all, by those companies joining forces to take coordinated actions against attacks on the industry. One such organization exists for the smaller U.S. shipbuilders. It is the American Waterways Ship- yard Conference, formed in 1976 by a group of shipyard executives. Longshore Act were passed, they were convinced that the days of "each yard for itself' were over. This complex network of laws makes this second tier of the ship- building industry possible in to- day's climate of foreign-subsidized or government-owned shipyards. A quote from Theodore Roose- velt never had more meaning than it does today for this segment of the shipbuilding industry repre- sented by the American Water- ways Shipyard Conference: "Every man owes a part of his time and money to the business or industry in which he is engaged. No man has a moral right to withhold his support from an organization that is striving to improve conditions within his sphere."